Hazel's Quilts: Ready to Sandwich! Isn't it a funny thing - you put the border on a quilt and it makes you do a step back and go 'Oooh'! Well it does me, anyway. Eleanor's Quilt top is finished, I've cut the wadding and backing, and will sandwich to tomorrow. 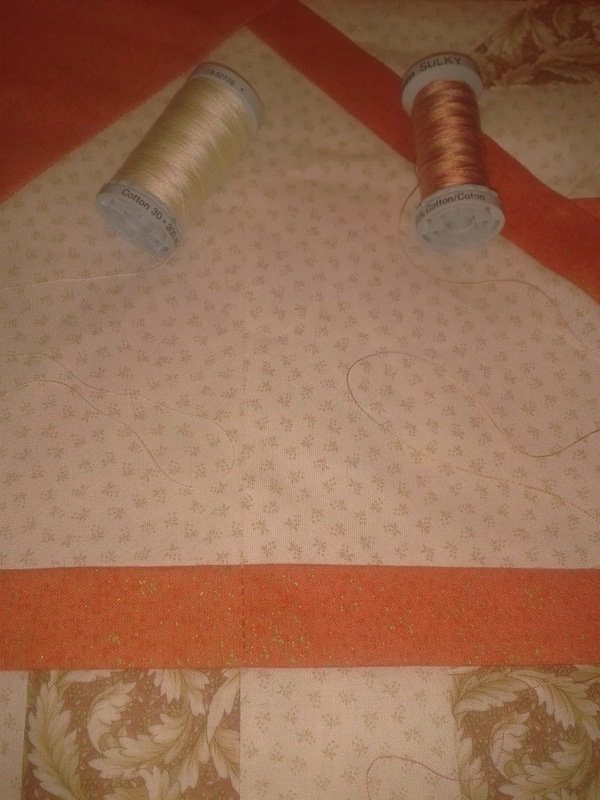 In the meantime, I have a variegated orange quilting thread, and a variegated cream. I think the cream will make the cut - you can't see much from the pic, I'm afraid. It's going to be an all over stipple, I think, as time is of the essence, but I'll think on that overnight. The quilt is lovely - fresh and very girlie. Beautiful quilt! It will be loved! Yay You! I love putting the borders on too, but my favorite is finishing up the bindings. I love that bit too - because I'm impatient to see the finish by that point, I think! That looks fabulous Hazel. 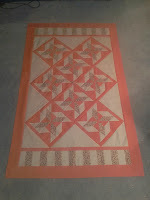 I love what the piano keys border has done to the overall look of the quilt. It worked out better than I could have hoped, Sue - I was worried that the piano keys would look like an afterthought. Looks beautiful. The colors are super. I have my "Ooh" moment when the quilt if finished. Thanks, Joanna - that agonising over fabric selection seems a faint memory now, but a big deal at the time! It looks great Hazel and the cream cotton suits it. Thanks, Sue - I'm going with the cream for quilting the body of the quilt as it will stand out less than the orange. I'm not confident enough of my FMQ to draw too much attention to it! 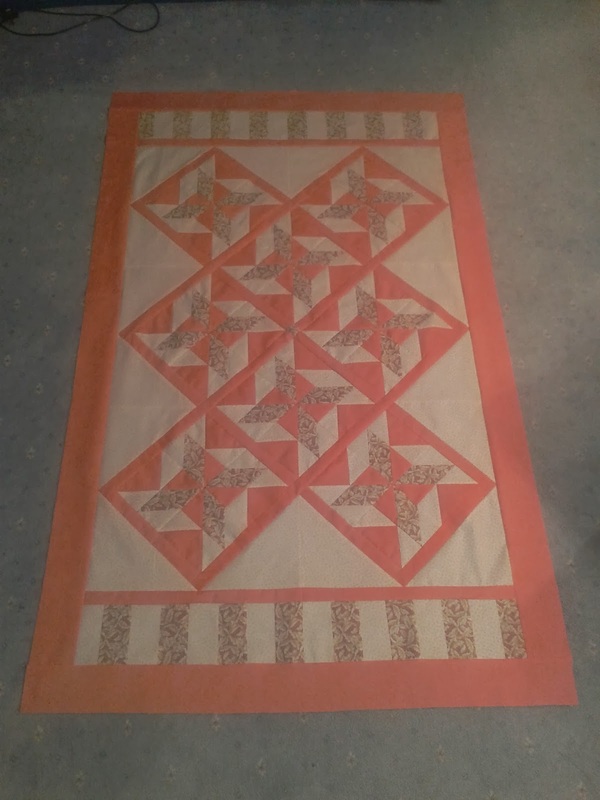 I go away for a little while and WHOOSH - you make an entire, beautiful quilt top in my absence :} Well done you! Regarding variegated thread - be careful, it's a lot trickier to use than it looks on the spool. Depending upon the colour of your thread and the colour of the fabric, sometimes it can look as if you "missed" quilting a section where the thread colour changes to be exactly the same as the background. You know how I know this - I have ripped out miles of thread in the past! Suggest you do a test on some left-over fabric to make sure you really like the effect before you start on the quilt. PS: you're right with borders, it's like putting a picture into a frame - really sharpens up the whole composition. Good point on the blending in of parts of the variegated thread - in an ideal world it would never be an exact match for the reason that you give. I'm planning on using the orange on the orange borders, but will take your advice and try on a scrap first. Eleanor's Quilt - Home Straight! Christmas QAL - September pt5 - Brains needed! What's Next, and WHEN next?